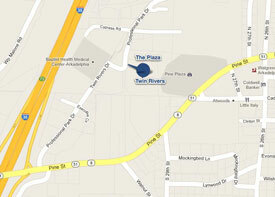 The Plaza at Twin Rivers is an extravagant full service assisted care facility, located in beautiful Arkadelphia, Arkansas. The Plaza is dedicated to bringing you peace of mind in beautifully designed, spacious single level apartments and single room living. This prestigious long term care facility participated with all major insurance payers, is licensed my Medicare and Medicaid, and has a 5 star CMS rating. We have received Clark County Nursing Home of the Year for 15 years, and were recognized by the Arkansas Foundation for Medical Care as an Innovator in Healthcare. This Rehabilitation facility is known for its diverse and innovative programs, has the most advanced technology, and has a highly trained, qualified, and caring team of Licensed Physical, Occupational, Respiratory, and Speech therapists along with the rehab nursing staff. What is assisted living? Assisted living is often viewed as the best of both worlds. Residents have as much independence as they want with the knowledge that personal care and support services are available if they need them. Assisted living communities are designed to provide residents with assistance with basic ADLs (activities of daily living) such as bathing, grooming, dressing, and more. What is skilled nursing? Nursing care communities are commonly referred to as skilled nursing and rehab centers or nursing homes. This is a senior living residence for people who need either long-term care or skilled nursing and rehabilitation services. These communities provide all of the personal care and services of an assisted living with the addition of 24-hour nursing care. How do the two differ from each other? Assisted living communities differ from nursing homes in that they don’t offer complex medical services.